Aging is a part of our human experience, and while it seems daunting — the wrinkles, the aches and pains, and the commercial for “help, I’ve fallen and can’t get up” — it is something we don’t all ponder until we are actually seniors! At Chicagoland Complete Healthcare, we are aware that the senior population is on the rise, so we offer adult medicine and geriatrics in preventative wellness, vaccinations, chronic disease management, and more. Learn more about the health issues seniors face in today’s post! The National Council on Aging found that more than 92 percent of seniors have at least one chronic health concern, with 77 percent with two or more. Chronic health conditions include heart disease, diabetes, high cholesterol, high blood pressure, arthritis and beyond. Arthritis – This health concern affects your tendons, joints, and ligaments, with more than 49 percent of people over 65 being affected. Arthritis greatly hinders your quality of life because it keeps you from being physically active and leads to chronic pain. Heart disease – This disease is the number one killer for adults 65 and older, and risk factors such as high cholesterol and high blood pressure contribute to your chances of developing the disease. Respiratory health issues – These health concerns include chronic obstructive pulmonary disease (COPD) and are the third most common cause of death in adults 65 and older. Having COPD, chronic bronchitis, or emphysema makes seniors more susceptible to pneumonia and other infections that can affect the quality of life. A person’s cognitive health correlates to the ability to learn, think, and remember, and it often takes a dip later in life. The most common cognitive health issue in seniors is dementia, which affects over five million Americans over the age of 65. Cognitive impairment significantly alters a person’s quality of life and makes them vulnerable living safely and independently. A very common health concern in seniors is emotional wellness, as they are prone to developing depression and other mental health concerns. As a result of underreporting, the statistics for senior mental health issues are thought to be much higher; the condition has a prevalence of over 16 percent of adults over the age of 60. The aging population falls prey to mental health issues from isolation, elder abuse, and other health-related issues. There is a reason the “help, I’ve fallen and can’t get up” commercial is so popular, because seniors are prone to nasty physical injuries such as fractures due to muscle loss and falling. In addition, seniors often suffer from osteoarthritis and osteoporosis that contribute to bone loss, thus increasing their susceptibility to fractures. In a recent study, it was found that 21 percent of AIDS cases are in people over 50 years of age. 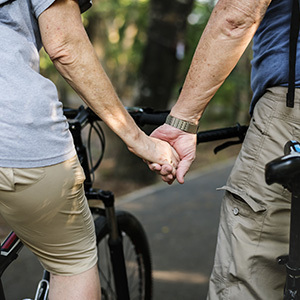 It is a misconception that sexual desire changes in seniors — though their needs and ability may be affected, they still participate in sexual activity. Seniors are less likely to use condoms, thus making them more exposed to STDs, and with compromised immune systems, this becomes a grave health crisis for many. Eating concerns can arise from many different health facets such as poor dental health, a weakened immune system that causes them not to feel hungry, depression, substance abuse, dietary restrictions, and a limited income, just to name a few. Because malnutrition is often underdiagnosed, it can lead to other health concerns such as bone and muscle issues. When we begin to lose anything from our hearing to our eyesight, it can be embarrassing and make seniors self-conscious to wear hearing aids or reading glasses, but it is a very common part of the aging process. The CDC reports that one in four seniors have a hearing impairment and one in six have a visual impairment. As the technology develops, seniors have more options for hearing and glasses that are small and less disruptive. This is often one of the most overlooked health concern of seniors, but it affects the quality of life hugely. When seniors deal with issues around cavities and gum disease, it directly affects their diet and self-esteem. As with any age group, regular dental exams are always recommended but can be hard for seniors because of their lack of access to proper health care. Substance abuse is overlooked and often missed in medical exams, but is a real issue among this group. Not only are seniors prescribed a host of long-term prescriptions, but coupled with another impairment such as dementia, they may forget they have already taken a pill and take another one. Drug dependency also results from seniors taking another’s prescription as a result of the inability to acquire and pay for their own. Constipation and incontinence are very common in aging adults. These could be as a result of other health-related issues, or prescription medications. It is imperative for seniors to maintain a lifestyle such as healthy eating habits and regular exercise to help prevent these issues. 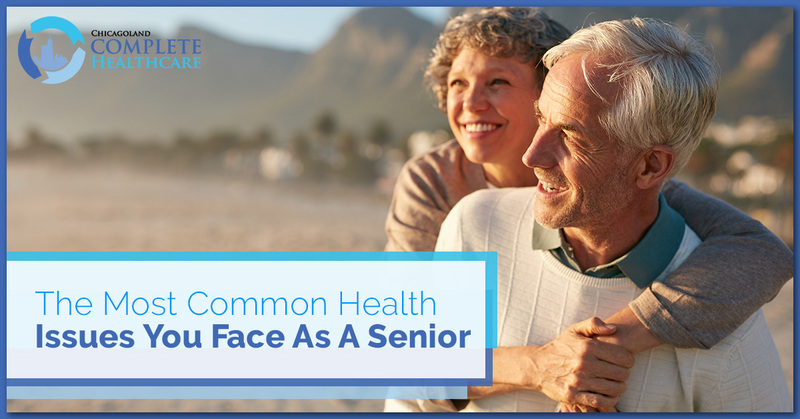 Seniors face a wide range of health concerns including cognitive, chronic disease, mental health, injury, STDs, malnutrition, dental health, substance abuse, and urinary and bowel issues. At Chicagoland Complete Healthcare, we want to help you find a solution to your healthcare needs. For more information on how we can help care for you and your loved ones, connect with us today!